In the Miami Valley, a reliable furnace is a necessity. Modern furnaces’ equipment heats and treats indoor air while being more energy efficient than older units. 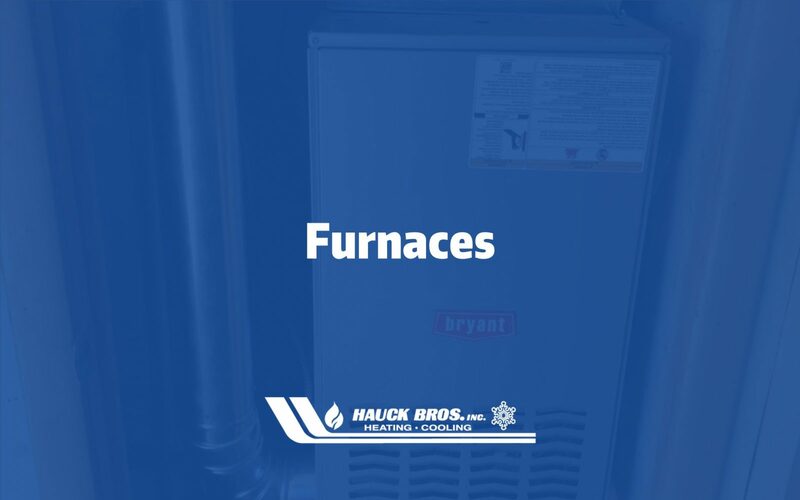 You can rely on the professionals at Hauck Bros., Inc. to install a new furnace for the first time, replace an outdated furnace, or service your current system. Since 1921, we proudly serve both residential and commercial customers with the industry’s leading equipment that will provide comfort for years to come. Depending on the fuel type, natural gas, liquid propane, electric, or oil, a furnace operates using forced air to transfer heat to air. The blower then sends that air throughout the connected duct work into the house or business, and then out through the vents. In a natural gas, oil, and liquid propane furnace, a pilot light ignites a series of burners inside the combustion chamber. The heat created from the burner enters the heat exchanger and transfers the heat to the air while raising the temperature set at the thermostat. The blower then takes the air and sends it through the ducts. An electric furnace uses an electrical ignition source instead of a pilot light to start the heating process. An electric furnace has conductive coils that work to heat the air for the blower to use in heating. Oil, with AFUE ratings up to 86.6% efficiency, and some other models offer variable speed operation. Oil furnaces provide dependable heat and can be paired with a heat pump or an air conditioner to provide maximum comfort throughout the year. Offering flexible installation options, oil furnaces come in traditional multi-poise models or low boy models. Gas, Natural Gas or Liquid Propane, with AFUE Ratings up to 98.3% and a model with modulating gas valves and a variable speed fan, gas furnaces provide dependable heat and can be paired with a heat pump or an air conditioner to provide maximum comfort throughout the year. These models can be installed vertically or horizontally to accommodate various installation needs. Electric, available as an all-electric furnace or an air handler with electric strips paired with a heat pump. These models can come with Variable Speed operation and paired with a heat pump can provide maximum comfort throughout the year. These models can be installed vertically or horizontally to accommodate various installation needs. Heat strips can be used in an air handler paired with a heat pump to serve as a back up to the heat pump for extreme cold situations. A single stage unit turns on when indoor temperatures exceed the temperature setting on your thermostat. Once the temperature set on the thermostat is reached it turns off again. Single stage furnaces always operate at 100% capacity. More efficient than single stage units, these units vary their output between two levels: high and low. Ideally, the low stage would satisfy the thermostat most of the time. When necessary, the high stage would turn on. This helps eliminate temperature swings and helps to better condition the air, making you feel more comfortable for longer periods of time. Variable speed units precisely control the airflow throughout your home in order to maintain the highest level of comfort. This allows the unit to run continuously, while consuming far less electricity than a single stage unit. The constant airflow has some key benefits, maximum conditioning and treatment of the air, less hot and cold drafts, and quieter operation. Furnaces play a big role in keeping home and businesses comfortable during cold days. Being able to raise the temperature inside allows for people to stay warm and comfortable. The temperature that feels comfortable may be different for everyone. With variable speed furnaces, having the air move constantly allows for better dehumidification during the cooling season when paired with an air conditioner or a heat pump and better humidification when paired with a humidifier during the heating season. Variable speed fans help better filtration and the lessening of hot and cold spots as well. Even with two-speed operation, having the low speed on the majority of the time makes the treated air feel more comfortable. Variable speed ECM Blower, the variable speed electronically commutated blower precisely and efficiently controls the flow of heated or cooled air throughout your home via ductwork. This allows for better airflow that reduces temperature swings as well as constantly treating the air for filtration and humidity management. Multi Speed ECM Blower, the multi speed electronically commutated blower can also adjust airflow like a variable speed blower but less precisely. They have up to 5 speeds available that change based on your airflow needs. PSC blower, the permanent split capacitor blower does not adjust airflow. It is set to one speed and operates at that speed 100% of the time. Modulating Gas Valve, found in the most efficient gas furnaces, the modulating gas valve allows for better comfort by turning on more frequently but at a lower stages to condition the air before 100% capacity is needed. The efficiency of furnaces is measured by Annual Fuel Utilization Efficiency (AFUE). AFUE is a measure of how efficient the unit is in converting energy from its fuel source to heat over the course of a typical year. AFUE is the ratio of annual heat output of the furnace compared to the annual fossil fuel energy consumed by a furnace. An AFUE rating of 95% means that 95% of the energy in the fuel type becomes heat for the building and the other 5% escapes to the outside of the building through the ventilation system. Electric furnaces installed inside a building have zero loss. The Federal Trade Commission (FTC) requires all new furnaces to display their AFUE ratings so consumers can compare their different efficiencies. Older units have a rating of 56%-70% AFUE rating. Newer non-condensing units have a 80%-83% AFUE rating. Newer condensing units have an 90%-98.5% AFUE rating. Condensing units have a secondary heat exchanger for better efficiency. Based on the US National Average for 2017, an 80% AFUE unit would save over $7,500 vs a 60% AFUE over 15 years. A 90%+ AFUE unit would save over $10,000 over 15 years. Check to make sure the furnace pilot light is on, if not lit re-light according the manufacturer owners manual. Make sure all return and supply registers are clean and unobstructed. Make sure to check and change or clean the air filter, on some models at least once a month. Make sure the area around the furnace is clear of debris and combustible materials. Check your thermostat and turn to heat to make sure it comes on. Check to make sure your Oil or Liquid Propane tanks are full. Generally, they are cheaper to fill during the cooling season than the heating season. With normal maintenance and care, furnaces can last over 20 years! Our experienced technicians can help you maintain the life of your equipment by performing a Home Comfort Protection Plan check on your furnace. Some inspections the technician will perform are checking the air filter, blower motor, blower wheel, transformer, gas leaks, flame sensor, thermostat, and more!